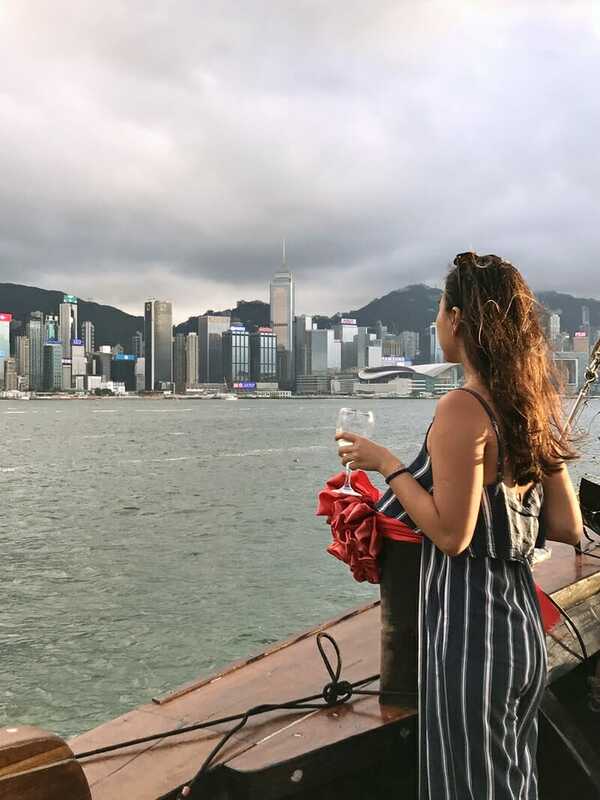 Going on a Hong Kong harbour cruise is one of the best things to add to your itinerary, whether its your first time to Hong Kong or your 10th! After dark, the harbour really comes to life and I can honestly say that it is one of the most stunning skylines in the world. The harbour sits between Hong Kong Island and Kowloon with boats dashing from side-to-side all through the day and night, and is one of the most iconic sights in Hong Kong. 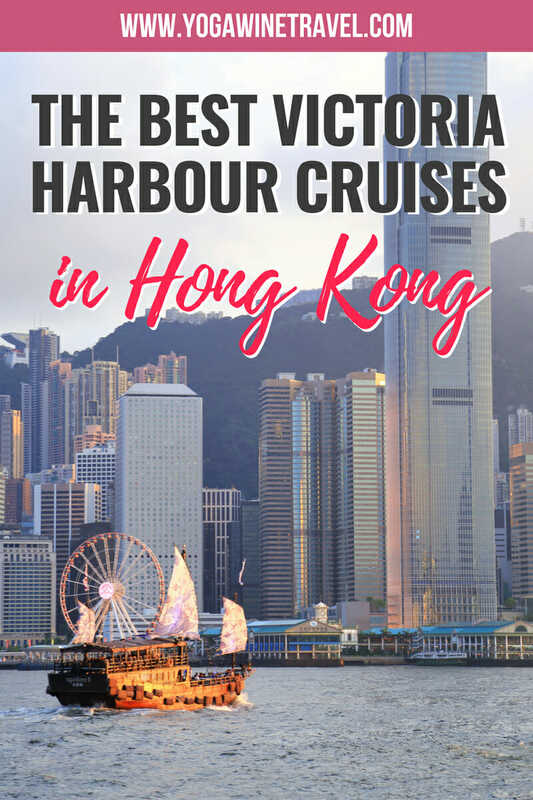 Whether it is your first time in Hong Kong or your 10th, going on a Victoria Harbour cruise is one of the best things to do in Hong Kong. 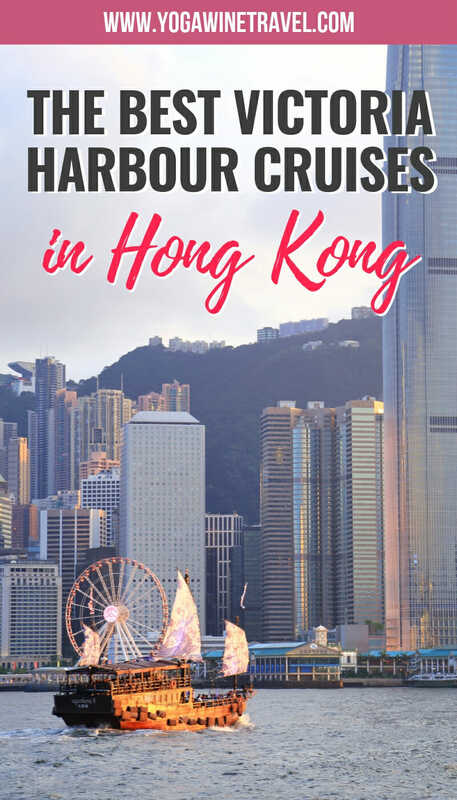 There are a handful of different Hong Kong harbour cruise options – here is everything you need to know about the various packages and cruise prices! Visiting Hong Kong for the first time? 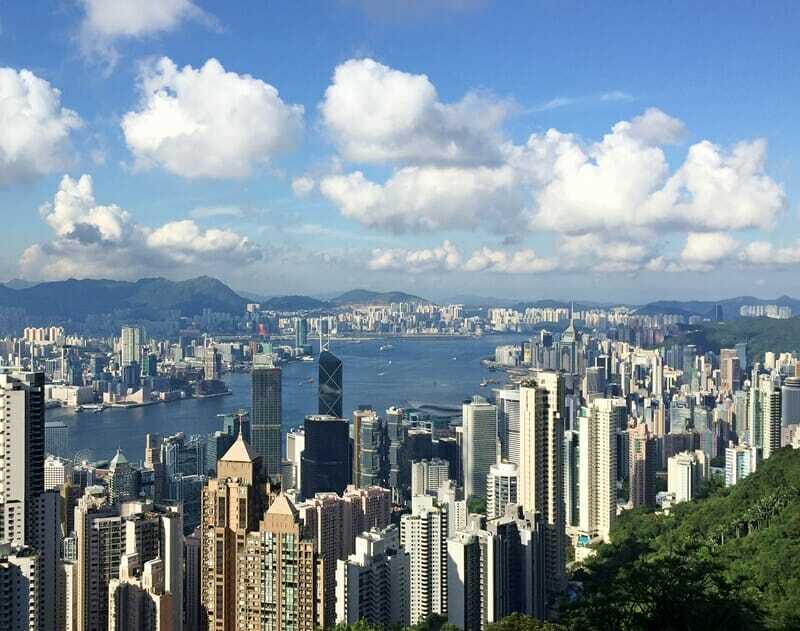 Here are some quick tips for your trip – for a full list of things you ought to know before your trip, head on over here to read 11 things you should know before visiting Hong Kong! The local currency is the Hong Kong dollar. The exchange rate is approximately 7.6 HKD to 1 USD. Most places accept Visa or Mastercard, and I’d say 40-50% of places will also accept American Express. There are tons of ATM machines around Hong Kong, just make sure you’ve enabled international withdrawal or your card has the “Plus” or “Cirrus” logo on the back. Click here for all of my Hong Kong insider travel tips and guides! Hong Kong gets 4 seasons! It is not a year-round tropical country as many people seem to believe. Summers are HOT and it gets fairly cold during the winter months (December to February). The best time to visit is from March to early June, and September to November (but avoid the 1st week of October as it is a national holiday in China and can get extremely crowded). Click here for more information on what to avoid if you’re visiting Hong Kong. 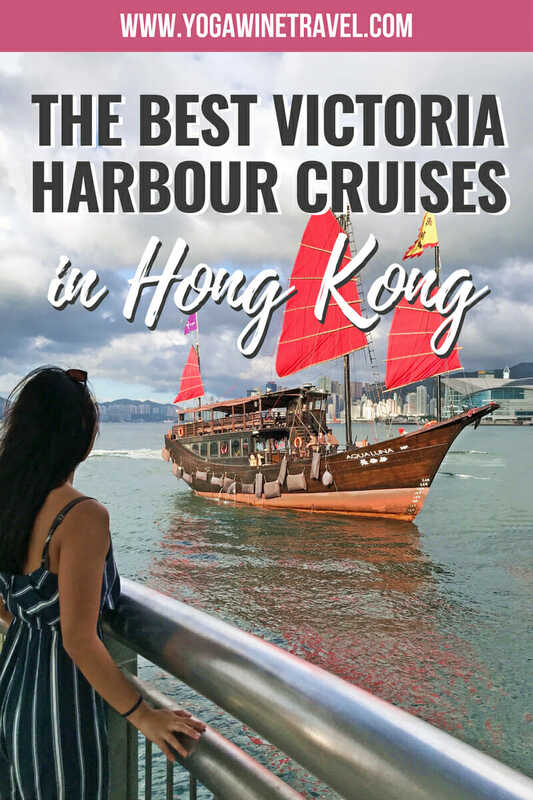 However, Victoria Harbour tours run throughout the year so you will always be able to get a spot on one of the cruises, though you’ll want to wear layers during the winter months. The tours may be cancelled in the event of a typhoon, so check online or give the company a call if you’re unsure. In my opinion, the best time of day for a Victoria harbour cruise is at sunset. The sunset time in Hong Kong varies between about 5:45 PM during the winter months to 7:15 PM or so during the summer months. 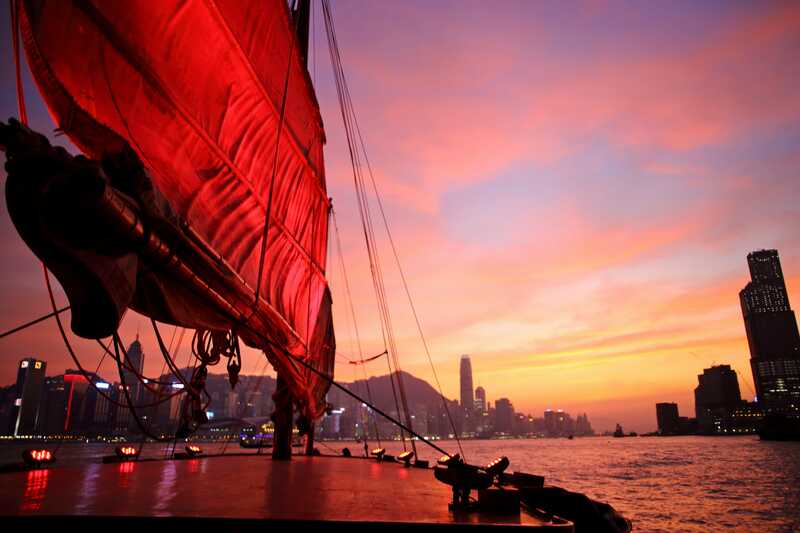 If you go on a sunset cruise in Hong Kong, try to time it so that you hop on the boat right before the sun sets so that you can enjoy the colours changing while you’re still on the water. The evening sailings during the “Symphony of Lights” light show at 8 PM every evening tend to be more expensive, and you’re probably better off checking out the light show from the Tsim Sha Tsui pier area. Looking for even more ideas for off-the-beaten-path things to do in Hong Kong? Read my guide to Hong Kong off the beaten track here! 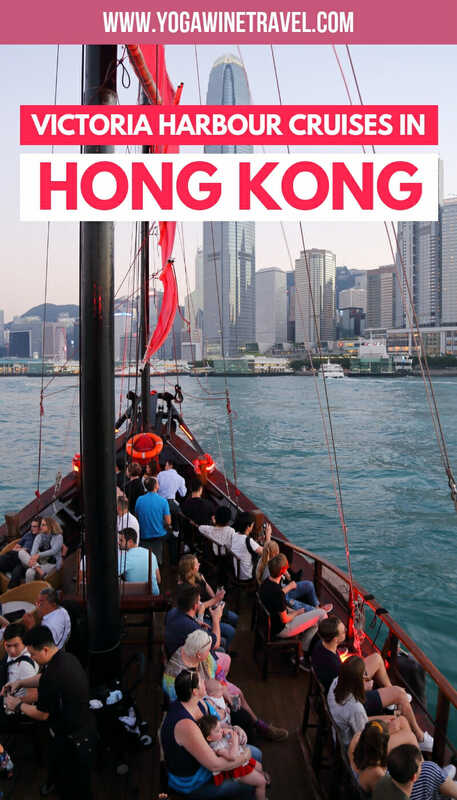 I pretty much tell everyone to go on a harbour cruise on the Aqua Luna, and have personally been on their famous sunset cruise in Hong Kong a bunch of times – it never gets old! 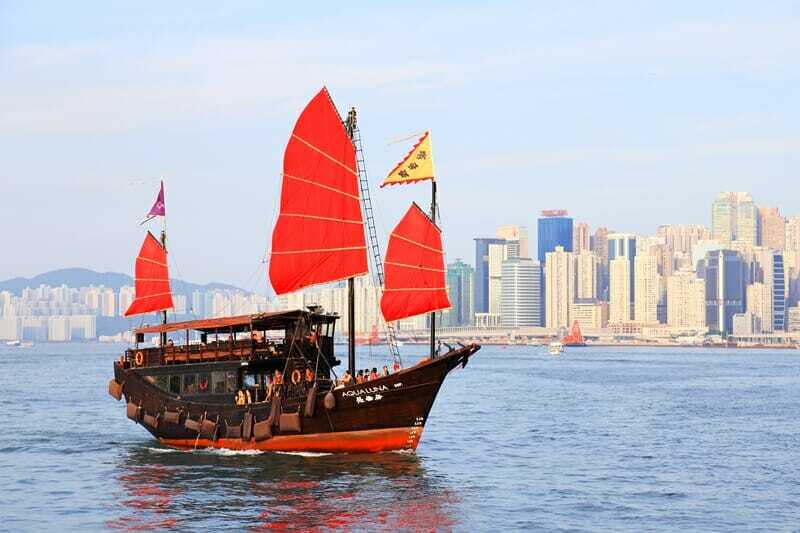 The Aqua Luna in Hong Kong is a restored old Chinese junk boat with bright red sails that hosts cruises, dim sum lunches and dinners along Victoria Harbour. 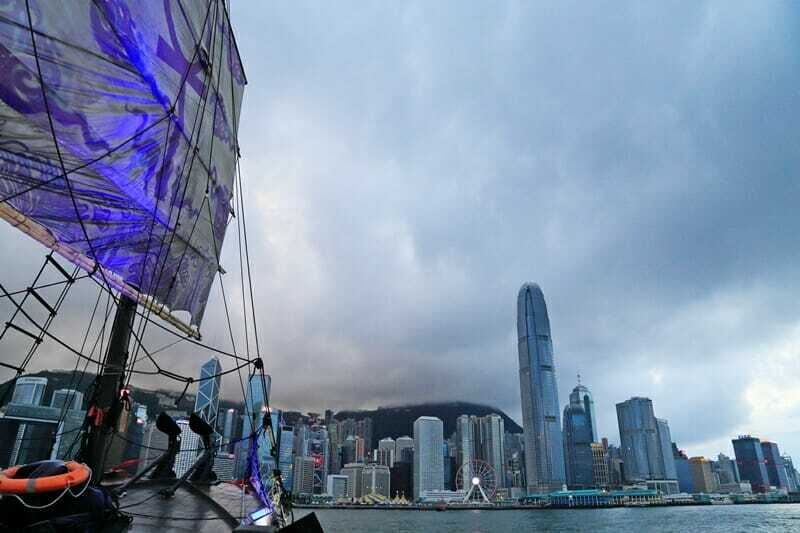 They recently added a new boat to its fleet with blue sails, and they both set sail between Central Pier 9 and Tsim Sha Tsui. If you are dead set on going on the boat with the red sails just wait a few minutes and it should dock soon after the junk with the blue & white sails, but occasionally 1 of the boats will be booked for private functions. If you’re not 100% sure, it’s best to call ahead to make sure the boat you want to go on is hosting cruises that day. Both Aqua Luna boats depart from Pier 9 in Central – your ticket includes 1 alcoholic beverage and the cruise will last approximately 45 minutes or so. 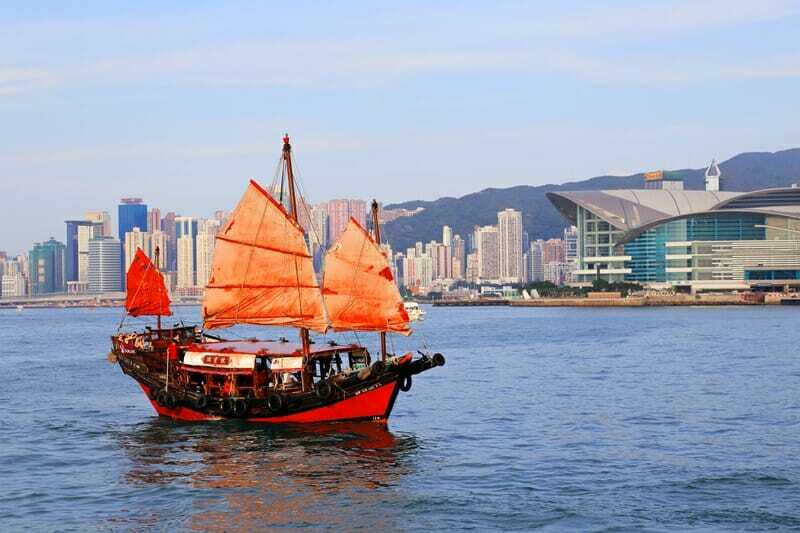 The ticket price varies between HK$195 to 295 depending on what time you set sail with them. Click here for the sailing schedule – get 10-15% off an evening cruise if you book here! How to get there: Pier 9 is located on the waterfront in Central. Catch any bus that heads to Exchange Square/IFC or hop in a cab – tell the driver that you want to go to “Gau Ho Ma Tau”. If you are boarding from Tsim Sha Tsui side, head to Pier 2 instead. 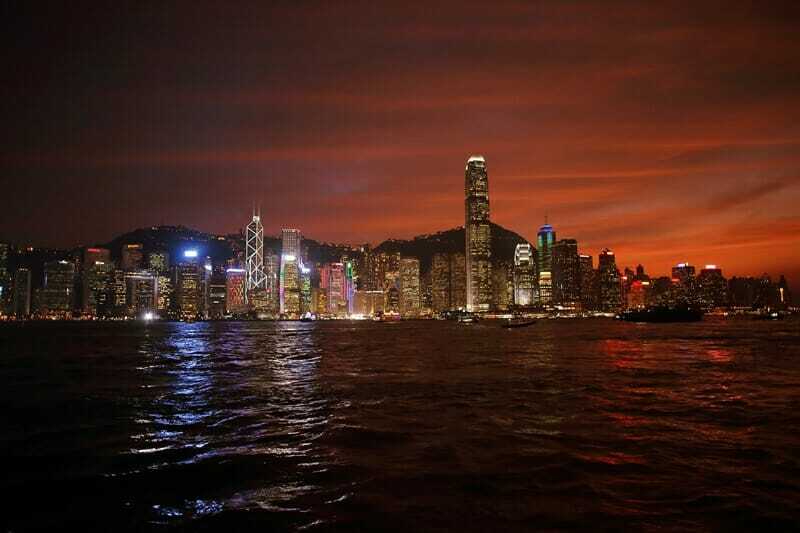 Looking for more Hong Kong sunset cruise options? The Dukling is one of the oldest Chinese junk boats still in operation, and like the Aqua Luna, also has beautiful bold red sails. It was built in Macau 50 years ago and offers an authentic cruise experience on a refurbished fishing vessel. Your ticket includes 1 drink and the cruise operator also hops on the microphone to give you some background information on the history of the junk and various landmarks along the skyline. Click here to see the Dukling sailing schedule and to book your tickets. How to get there: Pier 9 is located on the waterfront in Central. Catch any bus that heads to Exchange Square/IFC or hop in a cab – tell the driver that you want to go to “Gau Ho Ma Tau”. If you are boarding from Tsim Sha Tsui side, head to Pier 3 instead. Looking for more amazing views of Hong Kong? Click here to see some of the best rooftop bars in Hong Kong! The Star Ferry is an institution in Hong Kong and is one of the best ways to travel between Kowloon and Hong Kong. The Star Ferry boats have been in operation since 1888 and now also offers hour-long harbour tours on the classic ferry. The pricing of the Star Ferry harbour tour is less than the Dukling and Aqua Luna cruises, so is a good option if you’re on a slightly tighter budget. You can check out the sailing schedule here and book online to save 10-15% off your tour here! If you don’t want to go on a specific Hong Kong harbour tour, you can also catch the Star Ferry for a short ride across the harbour for under 50 cents, but the ride will only last a few minutes and literally takes you from one side to the next – no frills. 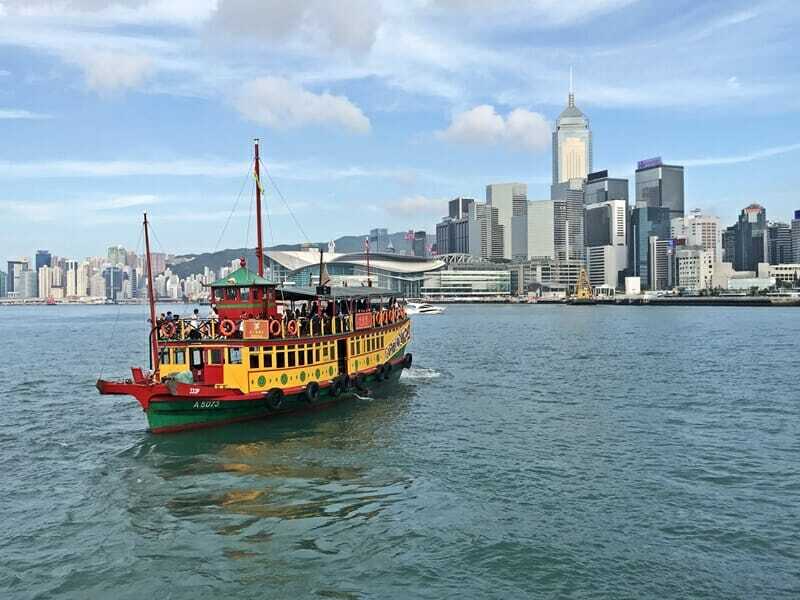 How to get there: For the harbour tour you will need to head to the Tsim Sha Tsui pier – take exit L6 at the MTR Tsim Sha Tsui Station or tell the driver you want to go to “Zeem Sa Zui Teen Sing Ma Tau”. To hop on the Star Ferry in Central, head to pier 7 on the waterfront. Catch any bus that heads to Exchange Square/IFC and then cross the foot bridge to the piers, or hop in a cab – tell the driver that you want to go to “Tsut Ho Ma Tau”. Want to get some grub after your Victoria Harbour tour? I’ve got tons of Hong Kong restaurant recommendations up my sleeve. Click here to see some of my favorite restaurants in Hong Kong! If you’re looking for something a little different, Wing On Water Tours also operates harbour tours on Victoria Harbour throughout the day. The pricing is on par with Aqua Luna and Dukling, and even though the boat isn’t exactly the prettiest thing to look at your ticket includes unlimited drinks on board – spirits, cocktails, wine, beer, soft drinks, tea & coffee! Check out the different cruise options and get 15-25% off your ticket if you book here! 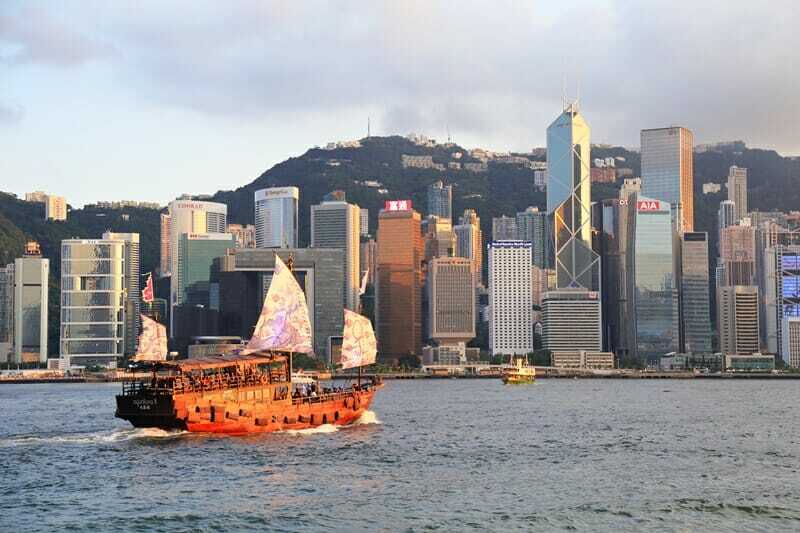 If dinner and a show is what you’re after, look into the Bauhinia Victoria Harbour cruise. 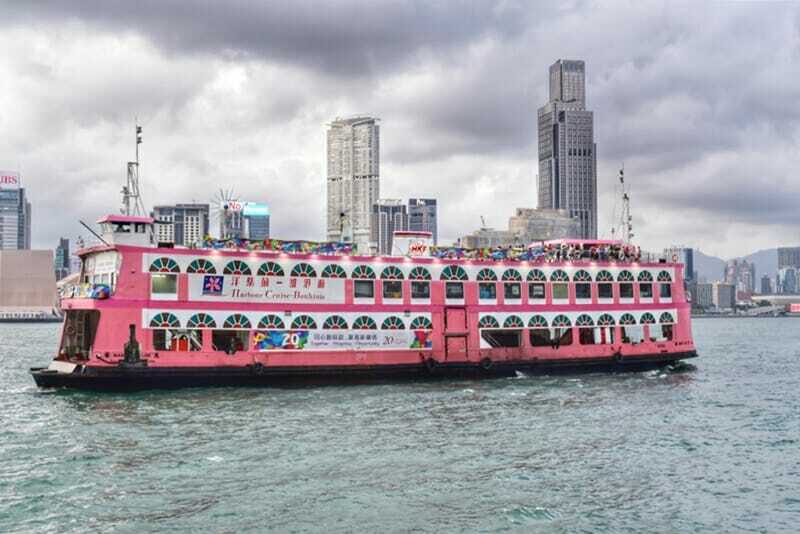 Named after Hong Kong’s emblem, the Bauhinia operates a 2-hour long Hong Kong dinner cruise with a live band. Unfortunately, the ship itself isn’t the most attractive, but is an option if you’re looking to spend a few hours on the water. Ticket prices range from HK$380 to $510 and is on the higher end of the spectrum as it includes dinner. Check out the sailing schedules and get 20-30% off the ticket price if you book here! 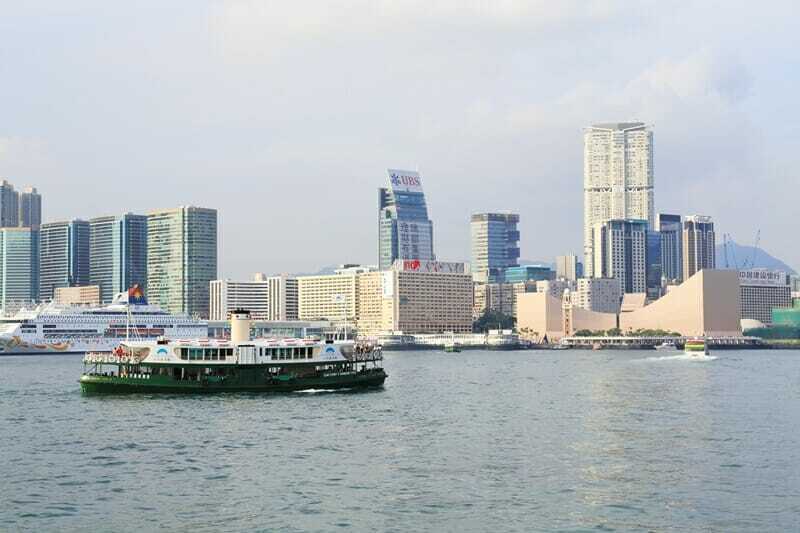 How to get there: Bauhinia starts its Victoria Harbour tour at the North Point pier. Tell the taxi driver you want to head to “But Kok Ma Tau”. Ready to book your trip to Hong Kong? Look into hotels in Wan Chai, Central, Soho, Sheung Wan and Causeway Bay for maximum convenience! 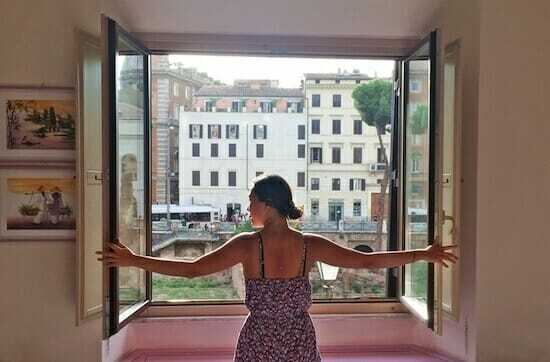 Click here to see current accommodation rates and options in Hong Kong. 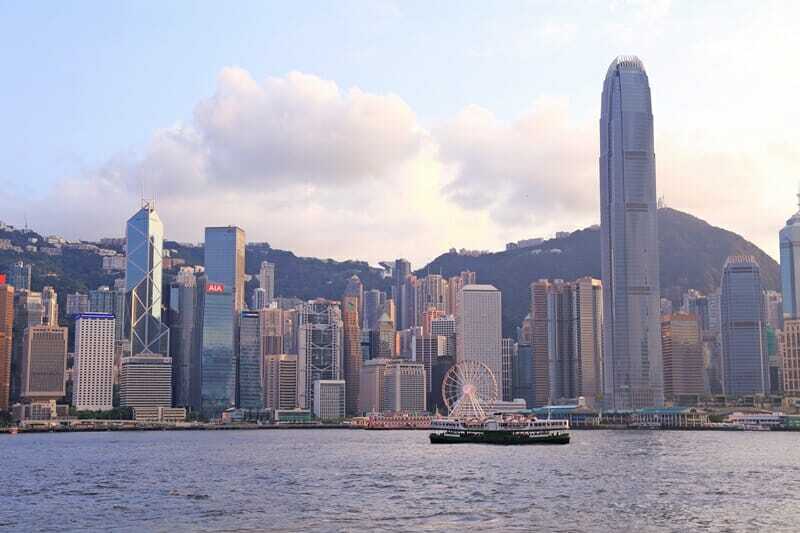 Going on a Victoria Harbour cruise is one of the best things to add to your Hong Kong itinerary. Have you checked out any of these boats yet?